Copyright International Ammunition Association, 2005. All rights reserved. These are just two of hundreds of MBA miniature rocket variations and other rounds of ammunition that range from 1.5mm Lancejets up to 40mm less lethal rounds produced by MBA. MB Associates, founded in 1960 by Robert Mainhardt and Dr. Arthur T. Biehl, PhD. operated until its acquisition by Tracor, Inc. in 1980. As many illustrations of actual gyrojets as possible will be used in the book Mel Carpenter is writing on the subject. Patent and engineering drawings are nice, but nothing beats seeing the actual item. The sectioning on these two rounds and others in his collection was done by Paul Smith. Paul is a true artist and offers his services to many collectors. He can be reached at the link above. This cartridge is a live 13mm gyrojet with a "wadcutter" nose. This copper-plated steel case was made on a screw machine, turned from steel bar stock. It was important that the thickness of the case be the same all around, so the outside of the case nose was machined to the same angle as the tip of the drill that formed the inside of the case, about 18 degrees. If MBA had chosen some other angle for the nose, it would have had to buy custom-made drills rather than use the much more economical standard versions with their 18 degree tip angle. The slight bevel where the side of the case meets the nose was to aid feeding of the rounds from the pistol's magazine into the barrel. The very small flat tip with a tiny teat was caused by the final resizing die. Note the "standard" nozzle with its groove to accept a case cannelure. But in this case, the nozzle is secured in the case by rolling over the end of the case. Also note that a broaching tool was used to broach, or scrape, some metal inside the case into lips that hold the powder grain in place as it burns. Without these, the powder grain could move back as the round accelerated and clog the ports. Most gyrojets had some sort of chemically treated string or paper, as in this cartridge, inside the hole in the grain to provide for "second fire" to ensure a uniform ignition of the grain along it length. The grains burned from the inside to the outside, and the outside of the grains were coated with an inhibitor, usually titanium oxide. The small pistol primer provided the "first fire" that ignited the treated paper or string, which then uniformly ignited the grain. Note the aluminum foil on the nozzle just inside the case. This was to waterproof the cartridge, and when it was fired, the foil covering a port was just blown out. One of the reasons that plain carbon steel was used for the nozzles, in addition to being cheap, was that as the cartridge was fired and the burning area of the inside of the grain increased as the hole got larger, the internal pressure of the round naturally increased. At the same time, the ports through which the gas was flowing eroded, or ablated, increasing the size of the holes and allowing more gas to flow, maintaining a nearly constant internal pressure. Carbon steel ablated at just the rate MBA needed. The lower cartridge is a 13mm dummy gyrojet with a round-nose nickel-plated drawn steel case. 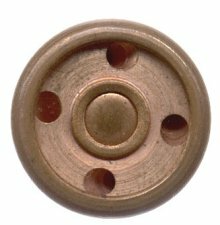 It has a rubber dummy "grain," as MB Associates (MBA) called the nitrocellulose propellant charge, which was in just one piece, or grain. Note the empty nickel-plated primer cup and the groove, or cannelure, rolled into the case that holds the "nozzle" in place. 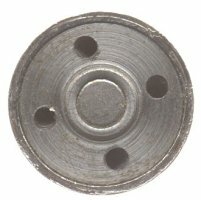 MBA called the steel base of the cartridge that has the holes, or "ports" drilled through at an angle, typically 15 degrees, and the small pistol primer pocket, the "nozzle." Copyright 2005 by the International Ammunition Association, Inc. All rights reserved.